A brushstroke of Kantor, an evocation of Calder and its burlesque touch make Bêtes de Foire infinitely precious! 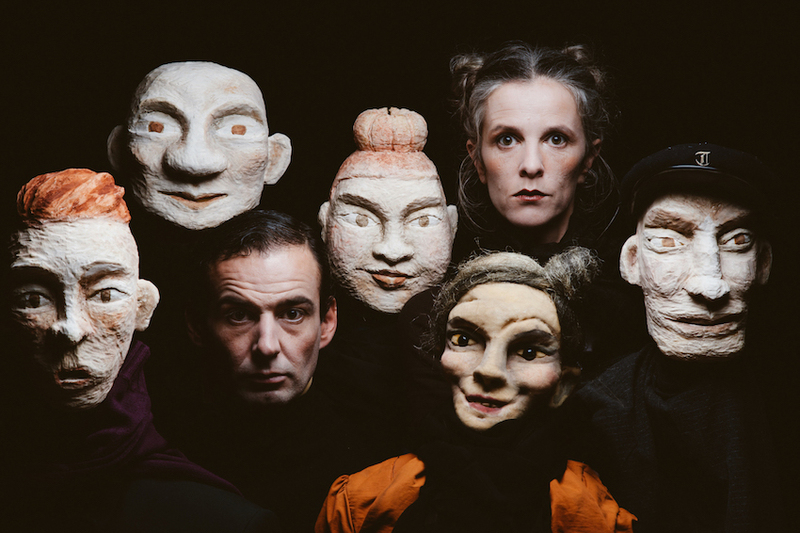 Absolutely not to be missed: circus, object theatre, dance and puppets! To see from 8 to 108 years! Conceived by: Laurent Cabrol, Elsa De Witte In the circus ring: Laurent Cabrol, Elsa De Witte, Sokha Set design: Laurent Cabrol, Elsa De Witte, assisted by Fred Sintomer Figure sculpture: Steffie Bayer Figure construction: Ana Mano, Thierry Grand Music: Mathias Imbert, Natacha Muet, Piéro Pépin, Eric Walspeck Sound design: Francis Lopez Lighting design: Hervé Dilé, Fabien Viviani Bench: Fred Sintomer Acknowledgements: Antonin Bernier, Laurent Bonnard, Tó Quintas, Nino /Amalia / Mélinée Administration: Les Thérèses Photography: Lionel Pesqué, Philippe Laurençon, Vincent Muteau Production: Bêtes de foire - Petit Théâtre de Gestes / Association Z’Alegria Co-production: Scène Nationale d’Albi, Derrière le Hublot, Capdenac Supports: Drac Midi-Pyrénées, Conseil régional Midi-Pyrénées Technique: Circus, object theatre, dance and puppets Language: Without words For audiences over: +8 Running time: 60 min. 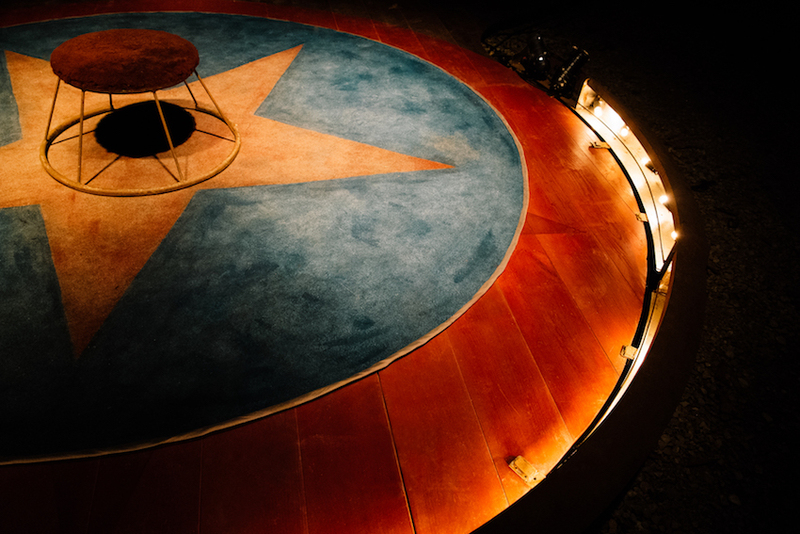 "A brushstroke of Kantor, an evocation of Calder and its burlesque touch makes Bêtes de Foire infinitely precious." Circus, puppetry, drama, dance and the silent films sensibility, with intelligence and talent. 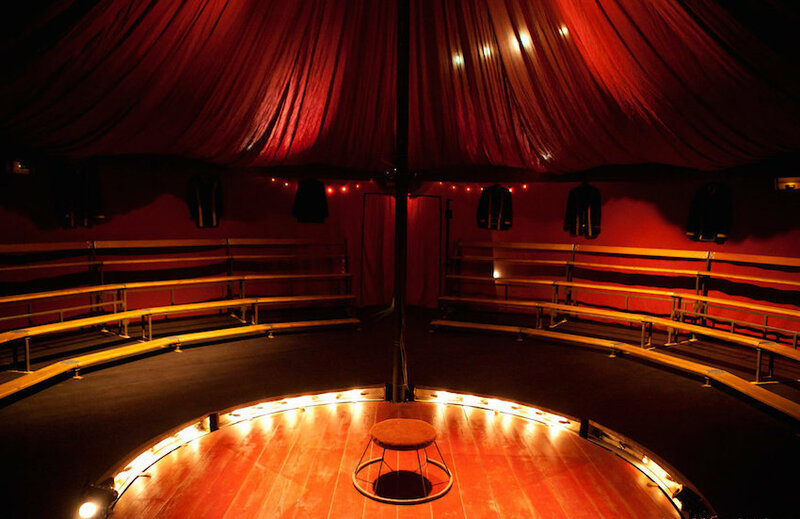 In a tiny circus tent where each object has its place, the two actors welcome us into their intimate world. A wonderful and poetic journey full of humor will delight the audience from 8 to 108 years old! An apprentice dressmaker improvises through mime the eccentric behaviour of the artisans. She tears then reassembles, unwinds and rewinds the bobbin thread, attentive to each and every detail. Another character, a ragged, dishevelled man, acts the awkward post-modern clown with a weary expression. 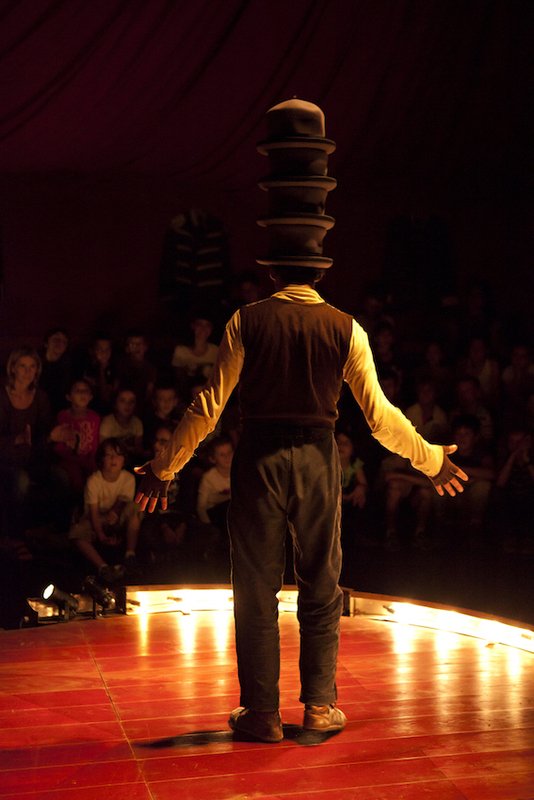 He juggles with hats that pile up, fly off or cling and fit together. He creates an unbridled ballet, a symbiosis of poetry and mechanism. 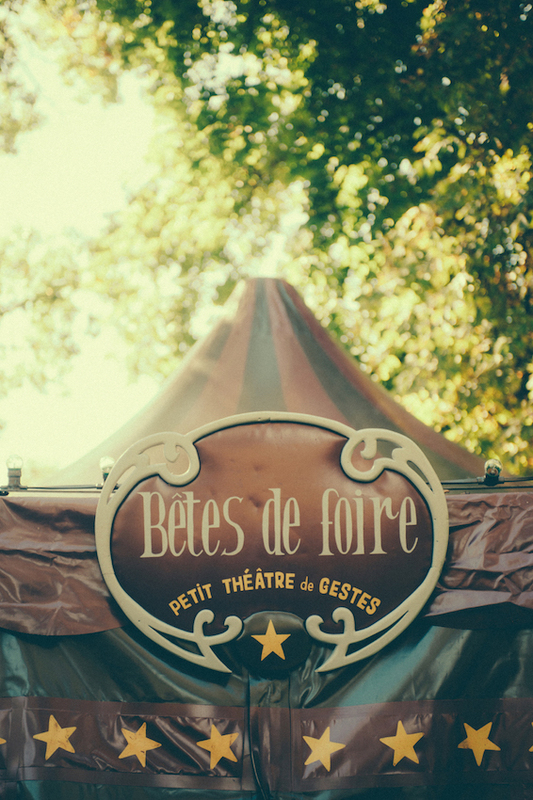 With Bêtes de Foire you can look forward to a whole range of emotions invoked by the world of classical circus. You will see a sequence of astonishing numbers which will have you glued to your seat and will take your breath away..
Bêtes de Foire is the result of the meeting between Laurent Cabrol and Elsa De Witte. Laurent Cabrol, a multi-talented circus artist, started around fifteen years ago learning juggling at Annie Fratellini's circus school and then at the school of Cirque Plume. In 1996 he received a medal at the Festival Mondial du Cirque de Demain. He co-founded several companies: the circus Convoi Exceptionnel in 1997, the Trottola circus in 2001. He worked with various artists such as choreographer Raphaëlle Delaunay. In 2010, he joined the company Théâtre du Rugissant, as a puppeteer. For about twenty years, he has collaborated regularly with Cirque Romans. Elsa De Witte has been an actress and costume designer since 1993 at Cie Babylone and Les Alama's Givres, and at other street theatre companies. In 2005 she integrated the show Le Bal des fous, of Les Chiffonnières and Théâtre du Rugissant, also as a puppeteer. Like Laurent Cabrol, she also participated in the show L'Oeil du Judas, du Théâtre du Rugissant, presented at FIMFA Lx12. 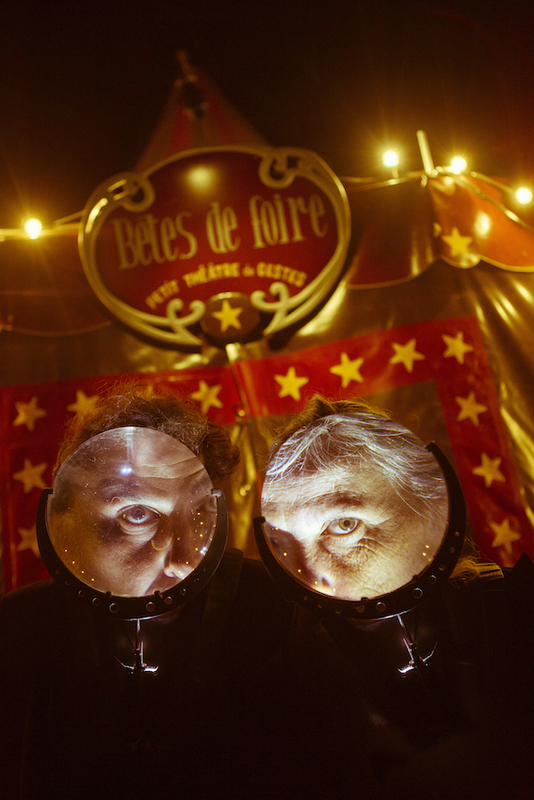 Bêtes de Foire reflects the image of this couple, crossing the arts and modes of expression: the theatre and the dance, the gesture and the sensibility of silent movies, puppetry and the circus, of course!